There really is nothing to watch on TV these days. That's pretty intense, although Domo would make for a very unique president. Domo wouldn't keep a private email server or degrade women. But for now, we have an even bigger problem: Domo's been sucked directly into his own television set! The hows and the whys really aren't important (although I'm suggesting NHK may be kidnapping him because he may have been secretly campaigning for a rival TV station, the All-Nippon News Network). As he disappears into the abyss, his friends look on in disbelief, among whom include the intelligent green tea fanatic rabbit Mr. Usaji; the fashion guru and auction-bidding enthusiast Tashanna, and Maya the alcoholic bat. I did not make any of those up. So how will Domo escape his bonds and return to the land of the living? By surviving a slew of mini-games, of course! What else did you expect? What we have here is a set of mini-games, accessible through a television schedule, similar to looking at a list of channels when browsing the menu of your satellite dish. And, like the satellite dish, there really isn't much on worth watching. As you complete certain games, more open up. 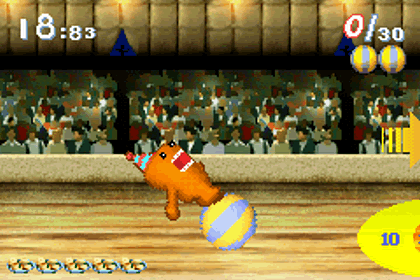 The mini-games cover a wide range of genres. One moment, Domo could be playing a difficult game of baseball (crucially titled "Dsight Baseball", named after oft-forgotten seven-time baseball MVP Lloyd Dsight — I made that up) in which he needs to predetermine where the ball is going to be before he takes a swing. The next moment, Domo could be climbing a tree, attempting to hatch eggs by, ummm... I never really figured this one out, actually. He can pick up sticks and worms but not really do much with them. Another has him rolling on a ball to try and stop it in the middle of a target for points, trying to ensure he doesn't fall off in the process... but he will. Believe it or not, Domo apparently has musical talent, too, as he tries to sing in a band with Dance Dance Revolution-style controls. None of these are particularly notable, although the baseball mini-game captured my interest for a short while before I realized how unfair it was. Domo arigato, Domo. You managed to make TV even MORE unwatchable. In addition to mini-games, players can check various episodes of Domo's news program, where a Domo in glasses and a fancy suit sits at a desk and reads you the evening's news. Does this influence the gameplay in any way? No. Plus, it's all in Japanese, so I couldn't say with certainty what the news of the day actually is. But why not wager a guess? "Man Kills Elephant, Stuffs In Trunk"
"Breed Of Tree Frog Discovered To Be Extinct When Last Specimen Croaks"
"Burglar Of Cereal Gets Life In Prison"
"Italian Phone Provider Nixes Rome-ing Charges"
"Sesame Street Biopic Gets Oscar"
Domo-kun no Fushigi Terebi (which loosely translates to "Domo-kun's Mysterious Television", by the way) uses heaps of pre-rendered graphics to show off our cocoa-coloured character. Honestly, the game looks pretty good in all its CGI mischief. That part of the overall presentation is pretty solid. The audio, on the other hand, gives me cause for concern. I'm not going to beat around the bush: Domo sounds frightening. He only makes one sound throughout the entire game, and they beat this sample to death like a dead horse that continues to be beaten with a baseball bat long after it's dead and turned into school cafeteria meatloaves. His voice sample sounds a bit similar to Flavor Flav shouting, "Yeah, boi! ", just with a slower tempo. I can't say for certain what, if anything, he's saying, but the tone and flexion of his voice sounds as though he is trapped in purgatory, where fellow souls are jabbing him with pointed sticks and laughing at his gargantuan mouth. This game is dividing. On the one hand, the wackiness and the pure allure of Domo can't keep me away from this title. On the other hand, all the mini-games are rather bland, and there aren't a ton of them to begin with. Ultimately, the almighty video game mantra dictates that gameplay trumps style; no matter how adorable or impressive your game looks, it's nothing if it doesn't hook the player. 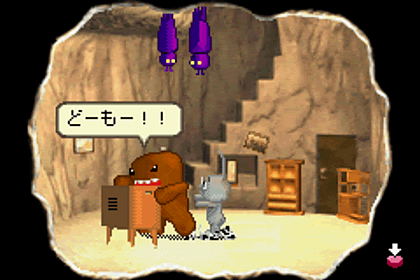 And Domo-kun no Fushigi Terebi fails to grab, except to hear his bone-chilling, tormented moans.